I just moved a static site to Github Pages, which required me to make some changes. The domain www.my-domain.com was a Cname pointing to my-domain.com. The domain my-domain.com was serving the website I had in webfaction. Email to chris@my-domain.com was working fine. The domain www.my-domain.com is a Cname pointing to myusername.github.io. The domain my-domain.com is serving nothing, and is set to webfaction for hosting and email. I don't know if email is still working yet, but I assume it is. 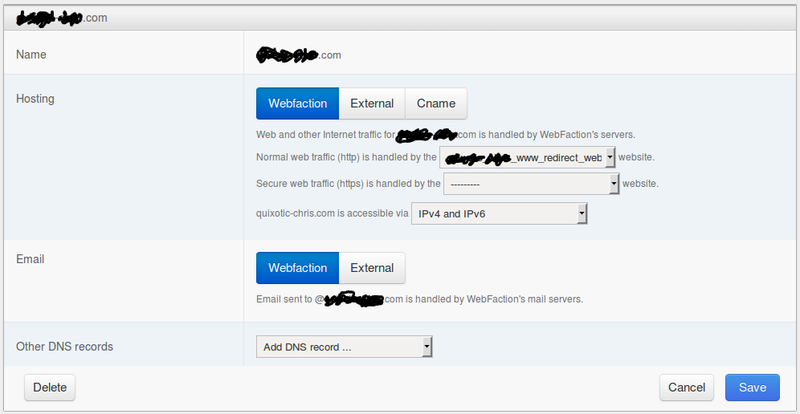 I thought I could just change the bare domain to a Cname pointing to the www version, but it looks like that will mess up email. Is there a way I can still get email to work while having the bare subdomain point to the www version, which is a Cname to GitHub? I implemented the redirect application as described in the link, and http traffic is working, but now emails are not reaching my inbox. Is there a way to debug this? I didn't make any changes to the domain other than changing the application. Edit to edit It looks like emails are actually being delayed by a few hours, or dropped. I'm going to open a support ticket instead. Thanks! You are correct that using a CNAME to point "my-domain.com" to "www.my-domain.com" would break email. This is because a CNAME means that one domain should inherit all of its DNS records from another domain, including MX records. So, creating a CNAME would cause the domain to inherit incorrect MX records and therefore break email. Your stated goal is to "point the bare domain to the www version", but it's actually more specific than that; you don't want to point everything (including email), you really most likely only want to redirect HTTP traffic. If that's true, and what you really want is just to redirect HTTP traffic so that the bare domain can be used in a browser, then you will want to use an HTTP Redirect application, not a CNAME record. Hope that helps! Hi Chris, feel free to open a support ticket and we'll be happy to take a closer look at your setup. If you set up a 301 HTTP redirect like this, then your users will see the "USER.github.io" domain name in their browser URL bar when they get to your site.